Being a system administrator, it is one of our key responsibilities to manage & monitor the production & enterprise servers, upgrading their kernel, installing latest available software packages & patches and carrying out other server routine tasks on daily basis while accessing the servers remotely. Telnet is the joint abbreviation of Telecommunications and Networks and it is a networking protocol best known for UNIX platform. Telnet uses the port 23 and it was designed specifically for local area networks. Telnet is not a secure communication protocol because it does not use any security mechanism and transfers the data over network/internet in a plain-text form including the passwords and so any one can sniff the packets to get that important information. There are no authentication policies & data encryption techniques used in telnet causing huge security threat that is why telnet is no longer used for accessing network devices and servers over public network. SSH stands for Secure Shell and it is now only major protocol to access the network devices and servers over the internet. SSH runs on port 22 by default; however it can be easily changed. SSH is a very secure protocol because it shares and sends the information in encrypted form which provides confidentiality and security of the data over an un-secured network such as internet. Once the data for communication is encrypted using SSH, it is extremely difficult to decrypt and read that data, so our passwords also become secure to travel on a public network. SSH also uses a public key for the authentication of users accessing a server and it is a great practice providing us extreme security. SSH is mostly used in all popular operating systems like Unix, Solaris, Red-Hat Linux, CentOS, Ubuntu etc. These are the very basic security tips for a Linux server, we will definitely discuss the important Linux Security Hardening tips in our upcoming article. 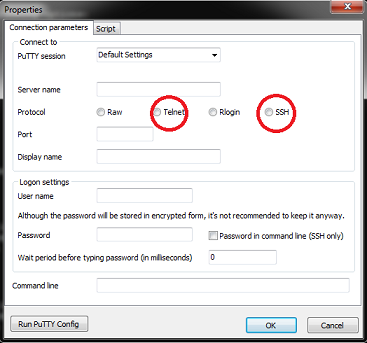 The famous tools to access the servers via Telnet or SSH are Putty, MTPutty and Secure CRT. SSH is dominant so far, it is also used to access Cisco devices as well.